It was never going to be aliens. 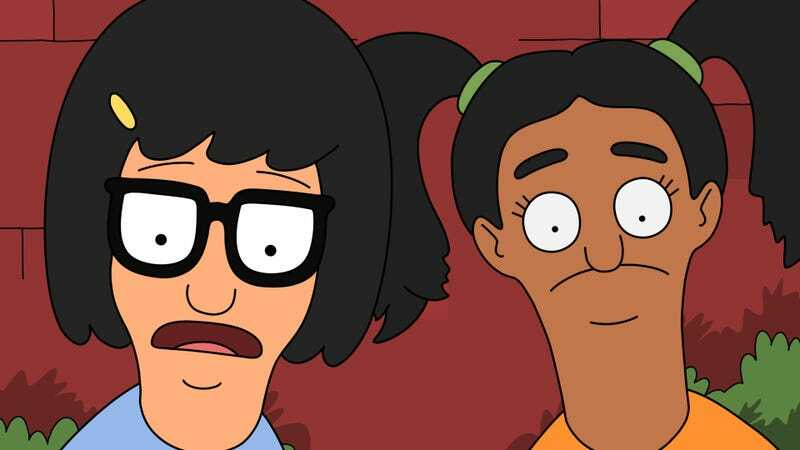 A lot of Bob’s Burgers’ animated siblings have an elastic enough continuity that it would be at least possible for actual aliens to pick up the kids’ signal—even The Simpsons did kind of canonize Kang and Kodos, to say nothing of still more off-the-wall shows like South Park or Family Guy—but the Belchers’ suspension of disbelief tops out at right around a two-butted goat. Since there’s no actual danger Tina and her science fair partner Susmita will actually contact extraterrestrials, the trick for “UFO No You Didn’t” is giving their story some semblance of stakes or a point. Otherwise, the episode risks being just too silly to work, reliant entirely on the solid but minor amusement of watching Tina and Susmita painstakingly lay out a detailed first contact procedure that will obviously fail. Indeed, that’s still the source of a good chunk of the episode’s low-key humor. Tonight’s episode doesn’t hide the fact that nothing much is happening outside the kids’ fervent imaginations. It’s just that, by story’s end, “UFO No You Didn’t” offers a simultaneously funny and heartfelt argument for why Tina and company’s wild imaginings matter. As Tina explains at the science fair, the real question of her and Susmita’s project isn’t if aliens are out there, but why peanut butter is called butter—sorry, sorry, the question is whether it’s worth accepting the risk of drawing attention to ourselves and trying to make contact. As this is Tina we’re talking about, her answer is always going to be on the side of taking a chance and hoping for the best. Her closing speech is something of an inversion of what we usually get from Tina in these situations. Typically, her arguments reflect her all-encompassing belief that life is better with boys and butts, and it’s borderline coincidental that she makes some applicable point. Here, she actually engages with all the startlingly downbeat science fair presentations to make a cogent point about how aliens could be a much-needed source of help, because we clearly aren’t able to figure out answers on our own. It’s only then that the episode brings this back round to more familiar romantic territory for Tina, with her closing point about dying alone inspiring Susmita to send some saucy Morse code Henry Haber’s way. That’s a sweet ending—or at least as sweet as an ending can be with Henry involved—and it does a nice job of demonstrating why Tina isn’t a total loser. We don’t meet that many actual smart kids at Wagstaff outside of Henry, who’s really more an aspiring supervillain than anything else. So it’s striking to hear Susmita drop actual scientific knowledge, with Tina’s weird ignorance seeming far more embarrassing when not paired with her siblings or still dumber kids like Jimmy Jr. or Jocelyn. Tina comes off as totally useless for a good chunk of “UFO No You Didn’t”—she can’t even commit to bubble letters!—but she shows what makes her special when Susmita reveals her own debilitating shyness. Tina, who I will never get tired of remembering was originally presented as the ultimate wallflower, is a paragon of confidence and boldness next to her partner. I mean, she’s still crushingly awkward, as ably demonstrated by her hilariously ill-conceived initial message, which requires her to both explain what bacon is and assure the alien readers that they won’t eat them. But Dan Mintz is so adept at conveying Tina’s underlying belief in herself, even as her words and thoughts and literally everything else fails her. She just keeps going, even if—no, especially if!—that ends in her kissing Zeke out of fear aliens are about to vaporize the planet. Because I’m exactly the kind of person you would guess I am, I’ve spent a lot of time watching The Simpsons DVD commentaries. A mantra that writers Bill Oakley and Josh Weinstein frequently share to describe their approach as showrunners in seasons seven and eight is that stories should be all about the family: A story might first be about Milhouse’s parents getting a divorce, but the eventual crux of the story should be about the Simpsons themselves. The logic behind this is that the show is at its strongest when it’s most tightly focused on the characters that audiences are most invested in. The potential downside is that always bringing the story back to the family limits the narrative possibilities, eventually robbing something like Homer and Marge having marital problems of its impact through three decades of repetition. Bob’s Burgers has impressed by taking the opposite tack and investing in its ever-expanding ensemble of weirdoes. The entire Wagstaff story takes as read that there’s nothing new here we need to learn about Tina or her siblings, even after they betray her for Henry. 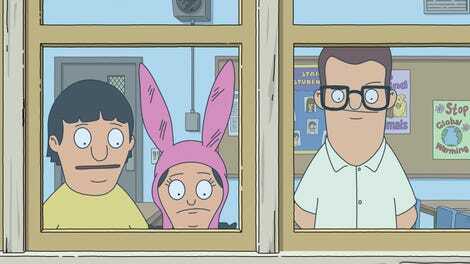 The theoretical conflict between the Belcher kids is quickly dismissed with Louise and Gene passing on Henry’s gift card reward to Tina as a supposed apology gift. To the extent anyone changes over the course of “UFO No You Didn’t”, it’s not Tina, but rather Susmita and Henry. One is a character we’ve never met before, while the other is one we’ve never really been asked to care about previously, at least not by Bob’s Burgers standards. Yes, Louise is there as an audience stand-in to wish for the planet’s destruction when Susmita and Henry start swapping Morse code, but their growth leading up to that silly moment still reads as something the show wants the audience to care about. It’s okay for the Belchers to take a backseat here because Tina and Louise are so well-drawn—the episode trusts us to know immediately that Louise isn’t comfortable betraying her sister, with no expectation that this requires further comment or exploration—and because Gene is such a reliable delivery mechanism for one-liners and also farts. And, as ever, none of these storytelling choices would work if the show didn’t care about all the weirdoes it has created. The result is a good-natured, relatively subdued episode, one that trusts in the kids and their goofy passions to drive the story. The episode would never ask us to take any of this seriously, other than the fact that the kids themselves do. As is typically the case with Bob’s Burgers, the show makes that an entire reasonable thing to ask of its audience. “First off, amazing boards. Great job, everyone. Seems like a lot of parents got involved, but no judgment.” Tina always calls them like she sees them. Tina and Zeke remain the show’s truest true pairing. Well, give or take Louise and Regular-Size Rudy, obviously. Maybe I’m overstating the case when I say this is a more subdued Bob’s Burgers episode, but then again, consider the last time we saw the Wagstaff Science Fair: Any story that doesn’t end with Tina almost getting electrocuted to prove a point about Thomas Edison has to be considered sedate. The story with Bob and the tiny coatracks is such a wonderfully silly throwaway subplot. There’s barely anything to it, even by the standard of flimsy restaurant side stories, so it’s a smart choice to make it ultimately be about Bob’s endless rivalry with Jimmy Pesto. That actually might be a case of the show wisely following The Simpsons’ lead and taking things back to the show’s core characters and conflicts, come to think of it.